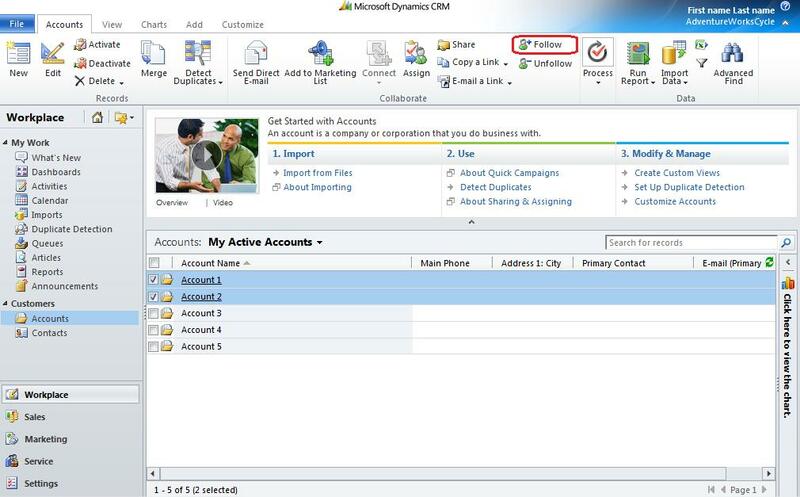 With the inclusion of Activity Feeds in the latest CRM update, we introduce the concept of “following” records. When you follow a record, you will see updates related to that record appear on your Personal Wall. 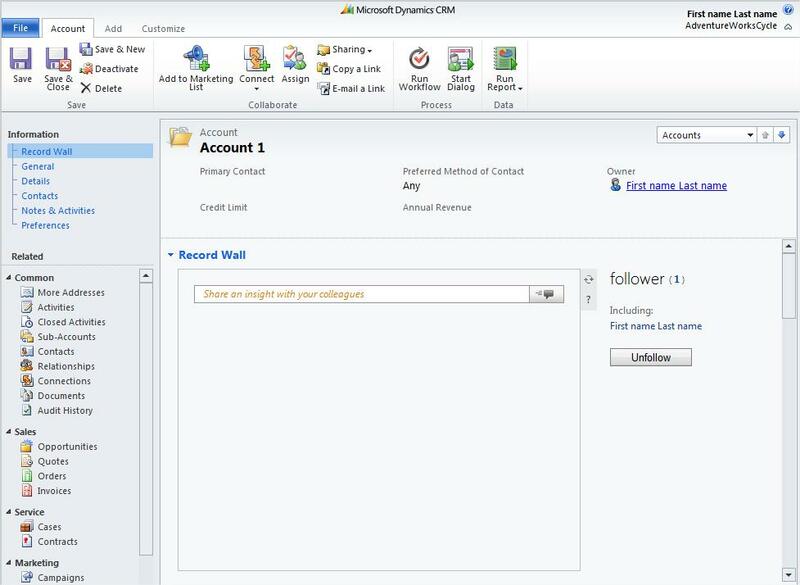 Here, we will go through the different ways you can follow records in CRM. Note that in order to follow any record of an entity, that particular entity must be enabled for Activity Feeds. 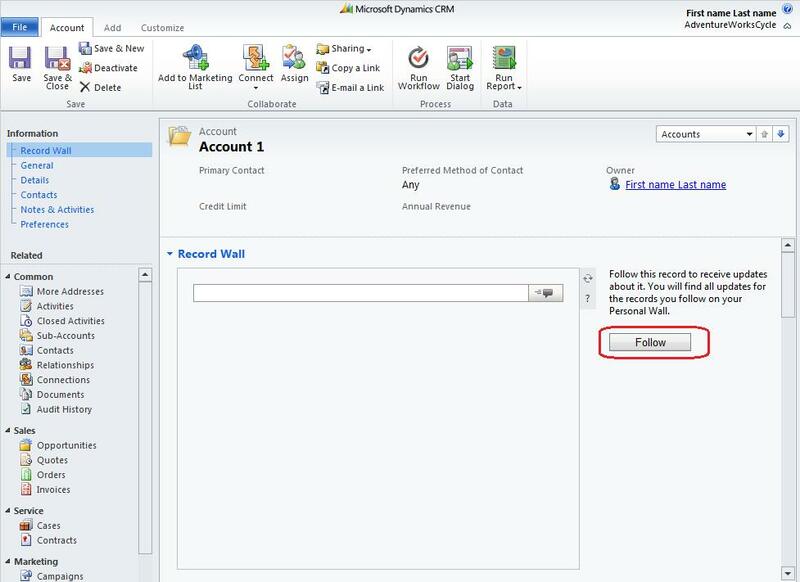 Once an entity has been enabled for Activity Feeds, you are able to follow records of that type from the record form. After opening the record form, navigate to the Record Wall tab where you will see a “Follow” button. All you need to do is click it. After clicking the Follow button, you can see that you’re following the record and have the option to Unfollow it. If you want to follow multiple records of the same type of entity, you can do so from the Entity Grid. Select the records you want to follow and click on the Follow button in the ribbon as shown below. 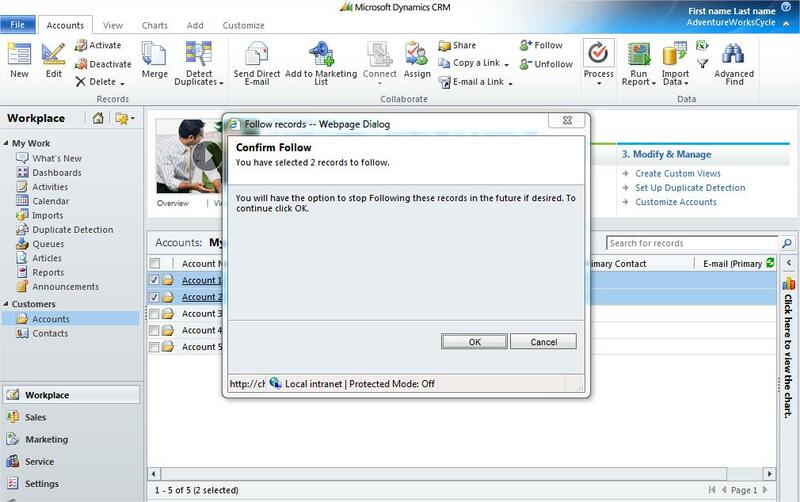 After clicking the Follow button, a confirmation dialog will pop up where you can continue to confirm that you want to follow the selected records or cancel out of the operation. Another way to follow multiple records at once is through Advanced Find. 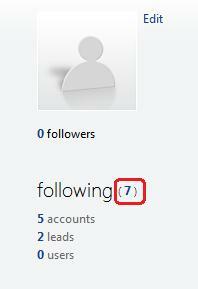 The same Follow button can be found in the ribbon on the page that displays the results of your query. On both your Personal Wall and own User Record Wall, there is a pane on the right-hand side with information about who’s following you and what records you follow. There is a link that shows the total number of records that you’re following. If you click on that link, a view called “Records Being Followed” pops up which shows all the records that you are currently following. From this view, you can then select certain records and click the Unfollow button on the ribbon to unfollow those records. In this example, we will create a workflow that has a user automatically follow accounts that are created. After this workflow is created and activated, you’ll be rest-assured that any newly created accounts will be followed without having to do any extra work. First of all, go to Settings à Processes à New in order to create a new workflow. 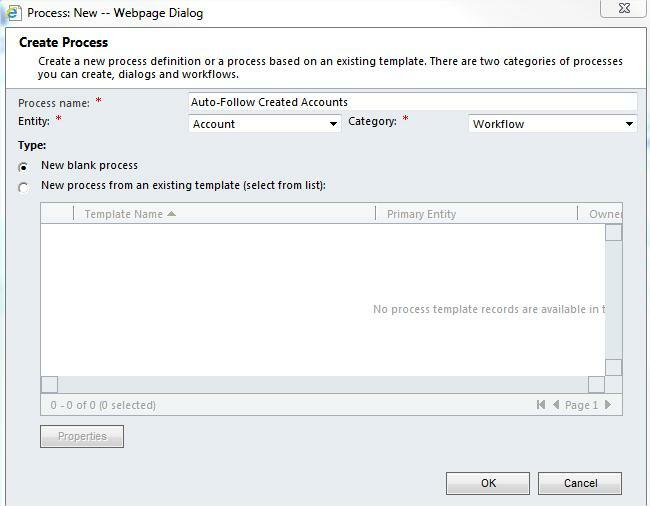 Enter a name and choose Entity == Account, Category == Workflow. The default option is to have the workflow “Start when” the record (the account) is created and that’s what we want so we leave that setting alone. Add a new step that creates a Follow and click Set Properties. In the properties, you want to set the Owner to be whoever it is you want to automatically follow accounts when they are created. Since you want yourself to auto-follow accounts that are created, find and pick yourself in the look-up. Save and Close. Once you save and activate your workflow, you’re all set! And of course, you can modify the conditions of this workflow to suit your particular needs. 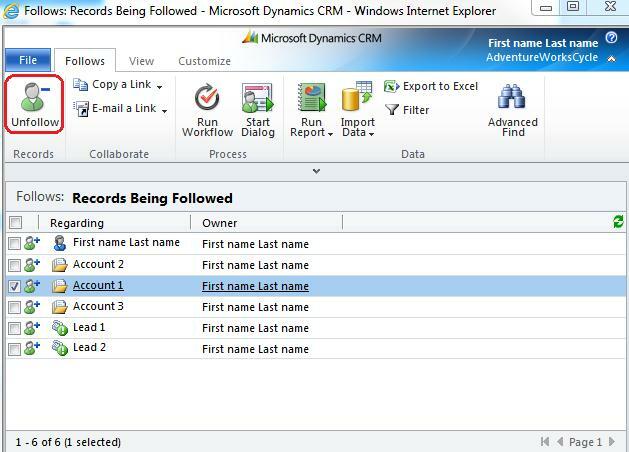 There you have it—various ways to follow/unfollow records in CRM. These are not the only ways you can follow records, but they are the most common routes that will be taken.